Small business owners often suffer from “DIY-itis” - the compulsion to do everything themselves. They figure that it’s cheaper and that they get a faster result because they don’t have to pay and/or wait for someone else to do it. It’s a fallacy; a lie we tell ourselves. And it’s holding us and our businesses back. It’s time to loosen the reins and let go of some of the demands we place on ourselves. Here are ten suggestions for tasks you can outsource now. There are plenty of sites from which you can buy pre-written content or have custom content created. The cost varies, depending on the quality of the writing. On average, it takes me 3 hours to write and review one blog post. So paying up to $100AUD for someone else to do it is a more than reasonable price to pay. If you’re taking a lot of calls during the day and you seem to be answering the same questions over and over, then you should look to have your phone answered by a Virtual Receptionist. Choose a service that is experienced with handling multiple businesses because they will ask you all the right questions to make the handover go smoothly. Cheap, message-only services will start around the $20-$40AUD per month mark. They will just take a message and send it to you. Virtual Receptionists are the next level up in terms of quality and the service they offer. They will do more than just take a message. They will give out information, assist your callers with their orders and take payment details. Costs for these services will start around the $80-$120 per month and will be based on the number of calls they take for you. This is a no-brainer, really. Most business owners hate doing their accounts and will go to all sorts of lengths to avoid doing them. Around July each year, they pay the price. Alternatively, you might use your accounts as an excuse to stay in your comfort zone. You may be putting off something else that you hate even more than your accounts. STOP IT! Get someone else to sort them out for you now. Costs can vary, again depending on the quality of the bookkeeping and the range of tasks you want them to achieve. Expect to pay at least $120AUD per month for a basic service. Yes - arrange for a cleaner. If you’re feeling overwhelmed, it’s likely that the ‘undone’ jobs around you weigh heavily. Maybe you’re feeling guilty that it hasn’t been done or worse, you’re procrastinating on the business tasks because you’re doing the housework yourself. It’s a false economy to do your housework over building your business. Housework [unless that’s actually your business of course!!] does not make you money. House/office cleaning - expect to start at around $40AUD per hour. Mobile car cleaning - starts at around $50AUD - they'll even come to your office! Even just try online shopping. It can take a bit of time to get setup, but once that’s done, you shop when it’s convenient to you. You don’t have to drive to the supermarket, find a park, find that they’re out of something you want, drive around to another supermarket to see if they have it… you get the picture. You can also get someone else to do your shopping for you. Check out websites like Airtasker.com to see if there’s someone nearby willing to take that task off your hands. If you’re running a business from home, you’re probably using a PO Box to avoid publicising your home address. Good thinking. But you need to check that mail box. Mailplus will get your mail for you and deliver it to you. Uplevel your business by getting a virtual office address with mail forwarding. People like to see a business operates from a legitimate address, so having only a PO Box is not the answer. Expect to pay from around $10 a week. This is one of the best things to outsource - especially in the summer. You can have your lawn mowed, edges done and the clippings removed for such a sweet price, starting from around $45AUD for a very small lawn. Naturally, your cost will depend on the size of your yard, the extent to which you’ve neglected it haha and the add-on services you require such weeding, weed spraying etc. I’d certainly consider this as an option to get your summer weekends back, even if you just had it done every other week. If your business relies on paperwork, then you’ve probably got a mountain of files and cupboards/cabinets to store those files. If you have document retention compliance as well, then you’re paying for archiving and there’s always a cost to retreive something from those archives. Why not consider digitising all that paperwork? There are numerous benefits including saving on space, storage costs, your time and the cost of retreiving documents from archives. If you have a decent scanner, then hire a high schooler to do the scanning and digital filing. Alternatively, there are document scanning services out there that will do it for you. If you’re using a virtual office, see if they offer a scan to email service so that your incoming mail is already digitised for you. Your furry family member deserves better than a hose down once every few months. If your dog is an inside dog, then you probably have to bath them at least every fortnight, if not not every week. That’s a lot of time. Most mobile dog washers will come to your place on a regular basis and once they’ve got into their routine, you don’t even need to be there. Here’s a hint though, wet dogs love to roll so they can dry their coat. They’ll find the smelliest place possible to do it too … like the horse paddock next door [I’m speaking from experience here, fresh horse poo smells like heaven to a dog]. It’s worthwhile paying a bit extra for the full blowdry so that wash doesn’t go to waste. This is a must for those entrepreneurs who are dealing with a high volume of emails from clients and prospects. Tim Ferriss, in his book “The 4 Hour Work Week”, details how to setup a process for a virtual assistant to manage your email. This will help you to structure your day so that you’re not distracted by incoming email notifications. You’ll setup a time to review the emails that your VA has flagged for your attention and then just deal with those. You’ll be surprised at how much more smoothly your day goes when you’re not dealing with all those distractions. Thank you so much. 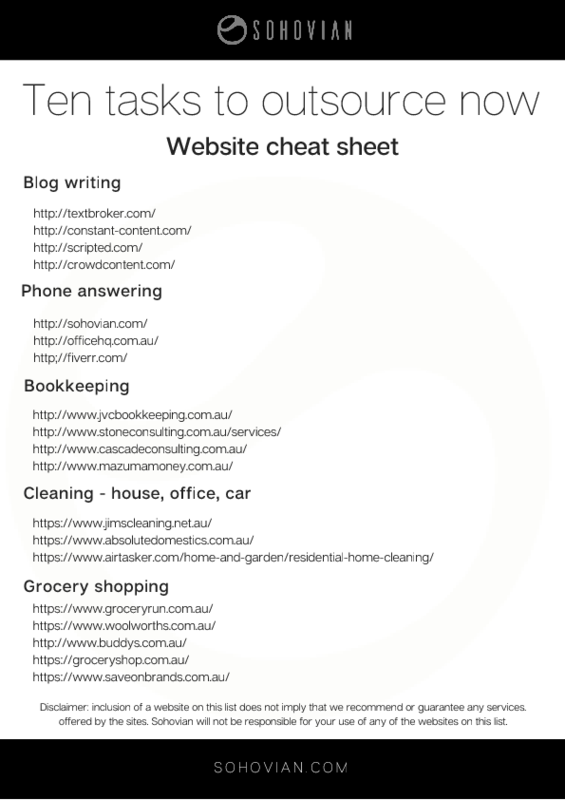 Click the button to download your outsourcing cheat sheet now.